What changes will make the 2020 Ford EcoSport different? Hopefully the addition of today’s most important safety features, prominent among them autonomous emergency braking designed to automatically stop the vehicle to mitigate a frontal collision. This and other vital driver assists have not been available on Ford’s smallest crossover, which debuted in North America for the 2018 model year. EcoSport (ECHO-Sport) is a subcompact crossover nameplate Ford began offering outside the U.S. in 2004. The version in showrooms here is based on the facelifted second-generation EcoSport that went on sale overseas in 2012. The tiny five-seater has been successful in emerging automotive markets such as Brazil, China, India, and Thailand. Acceptance has been slower in North America, where stubby styling, a cramped back seat, a side-opening cargo door (as opposed to a traditional rear liftgate), and underwhelming performance are hurdles. Still, through October 2018, the EcoSport had climbed to No. 5 in sales among 14 entries in the subcompact-crossover class. Sales are less than half of the segment-leading Subaru Crosstrek and well behind those of the Jeep Renegade, Chevrolet Trax, and Honda HR-V, but ahead of rivals such as the Toyota C-HR, Mitsubishi Outlander Sport, and Nissan Kicks. Should you wait for the 2020 model or buy the 2019? Wait, because important safety features may become available. A Ford marketing manager recently confirmed to us that the automaker plans to make its “Co-Pilot 360” suite of driver aids available on all Ford vehicles from model-year 2020 onward. Similar to rival safety suites such as Toyota Safety Sense and HondaSensing, Co-Pilot 360 includes forward-collision warning, lane-departure alert with automatic steering correction, and most important, autonomous emergency braking with pedestrian detection that can bring the vehicle to a complete stop to avoid a frontal collision. Which 2020 EcoSport models might be available with Co-Pilot 360 was not made clear. But we’re hopeful these key features will be standard on all trim levels. We’d also urge Ford to make blind-spot and rear-cross-traffic detection standard across the board. Adaptive radar cruise control that can maintain a set following distance from traffic ahead is part of the uplevel “Co-Pilot 360 Plus.” It’s unlikely EcoSport will be available with this feature until the next-generation replacement arrives, likely for model-year 2022. If you’re not bothered by its lack of driver assists – or its other shortcomings — there’s little reason to wait for the 2020 EcoSport. Though it’s likely to cost more, it should be a virtual rerun of the 2019 model, itself a rerun of the 2018. Expect a repeat of the four-model lineup: base S, volume-selling SE, sporty SES, and luxury-themed Titanium. Frankly, seeking out a 2018 EcoSport might be the most attractive option on the table. As of late 2018, dealers had plenty in stock and at substantial discounts — $4,000 or more in some instances. Given EcoSport’s budget pricing, you could potentially acquire a new subcompact crossover for under $20,000. No. From most angles, the 2020 EcoSport will again look like a miniaturized version of Ford’s larger compact-class Escape crossover, albeit with some odd proportions. EcoSport is very short and relatively tall, although to its credit, the styling itself treads a middle ground between class wallflowers like the HR-V and lampshade-on-the-head embarrassments like the Toyota C-HR. EcoSport’s most interesting exterior feature is its side-opening rear cargo door. The release mechanism is cleverly hidden within one of the taillights. The door is hinged on the right to open away from the curb. Urban dwellers might find this useful but any owner’s going to contend with the door’s rather heavy weight, meaning it will be awkward to close especially if your hands are full. Cargo volume is class-average, at 20.9 cubic feet with the rear seatbacks up and 50.0 with them folded. An adjustable cargo shelf allows for some shallow underfloor storage. Expect visual differences among trim levels to be largely limited to wheel size and style. Base S and volume-selling SE grades should return with 16-inch alloy wheels, while the sport-themed SES and flagship Titanium repeat with 17s. The SES will retain a slightly lowered sport suspension and blackout exterior trim pieces. A Black Appearance Package for the SES added for 2019 should return with a black roof and additional dark-colored body addenda paired with certain exterior colors. The ’20 EcoSport’s straightforward control layout won’t change. All but the S grade should return with a tablet-style touchscreen interface for infotainment duties. The SE will again come standard with a 7-inch unit that support’s Ford’s Sync 3 system along with Apple CarPlay and Google Android Auto. Optional on this model and standard on the SES and Titanium will again be an 8-inch screen that adds imbedded GPS navigation. Automatic climate control with heated front seats should remain standard on the SE and above. It works well enough, but the buttons are mounted a bit too low on the central control stack for our liking. The driver and front passenger should continue to have good headroom and adequate legroom. The driving position is surprisingly tall, which gives a good overall view of your surroundings. Seat comfort is decent, but wider folks might find the front buckets somewhat confining. Far less accommodating is the rear seat, which is so cramped for legroom as to be a deal breaker if you plan to put adults or teens back there very often. Blame EcoSport’s 99.2-inch wheelbase (the distance between the front and rear axles), which is by far the shortest of any subcompact crossover. Unlikely. The ’20 EcoSport should again be unique in its competitive set by offering a three-cylinder as one of its two available engines. It’s a 1.0-liter from Ford’s turbocharged EcoBoost (E-co boost) engine family and makes 123 horsepower and 125 pound-feet of torque. It’s likely to remain standard on all but the SES model and continue to be available only with front-wheel drive. 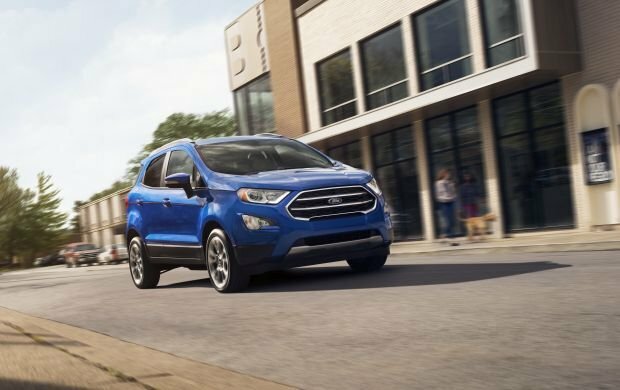 Standard on the SES and apt to remain optional on the other ’20 EcoSport models is a non-turbocharged 2.0-liter four cylinder of 166 horsepower and 149 pound-feet of torque. It’s paired with traction-aiding all-wheel drive (AWD). The extra 43 horsepower is a lot on paper, but on the road, these EcoSports don’t feel any quicker thant the front-drive turbo three-cylinder models. Blame the additional 300 pounds of curb weight they must carry. And while all EcoSports use a six-speed automatic as their sole transmission, with the four-cylinder engine, it somehow suffers a lethargic shift action that isn’t evident with the turbo three. A three-cylinder model may be more fun to drive but no EcoSport can match the road manners of segment benchmarks such as the Renegade and Crosstrek. Steering feel and road grip are fine but EcoSport’s tall build translates into copious body lean in fast turns. The short wheelbase doesn’t help this tiny wagon absorb bumps very well, so test drive over a rough road before deciding. Ride quality is best with the SE’s 16-inch tires and worst in the SES because of its firmer sport suspension. Don’t count on it – even though this is a clear shortcoming for a vehicle pitched at penny-pinching millennials. With no changes to powertrains, the ’20 EcoSport will likely remain near the back of the subcompact-crossover pack for EPA ratings. Expect a repeat of the 2019’s ratings: 27/29/28 mpg city/highway/combined with the three-cylinder engine and front-drive and 23/29/25 mpg with the four-cylinder and AWD. Both engines will continue to use regular-grade 87-octane gasoline. Possibly, given word that all Fords are to receive more advanced driver-assistance features. As mentioned above, we are hopeful everything in Co-Pilot 360 will be standard across the board. Realistically, though, in order to maintain EcoSport’s low prices, these aids might be limited to the subcompact crossover’s higher trim levels. Expected to return as standard on the SES and Titanium and optional on the SE are blind-spot alert with rear cross-traffic detection, both very useful features. The SE is where to start shopping the ’20 EcoSport line. We don’t recommend the S grade anyway, mostly because of its tiny 4.2-inch audio screen. The SE comes standard with lots of worthwhile conveniences, including a 7-inch infotainment screen with Sync 3, Apple CarPlay and Android Auto; keyless entry with pushbutton engine start; a power sunroof; rear-obstacle detection; nicer seat upholstery; heated front seats; a power driver’s seat; rain-sensing windshield wipers; and automatic climate control. Co-Pilot 360 would likely become standard at this level. The 2020 EcoSport SES will again be similarly equipped to the SE but come with the sport suspension, AWD, four-cylinder engine, and unique trim and wheels. The Titanium will return with standard leather upholstery, upgraded audio system, and specific exterior accents. They’ll likely increase, especially if Co-Pilot 360 becomes standard. The good news for shoppers is that competition in this price-sensitive class is growing and Ford can’t risk too big an increase. For reference, base prices we list here are for the 2019 model and include Ford’s $995 destination fee. With the three-cylinder engine and front-wheel drive, the S starts at $20,990, the SE at $24,145, and the Titanium at $27,155. With the four-cylinder and AWD, base prices are $22,585 for the S, $25,645 for the SE, $28,270 for the SES, and $28,665 for the Titanium. Co-Pilot 360 could add another $500-$1,000 to the sticker price, on top of any year-over-year inflation. That moves a loaded SES or Titanium close to the $30,000 threshold, where many larger and better-performing compact crossovers are available. As for other 2020 EcoSport options, expect the SE Convenience Package to return. 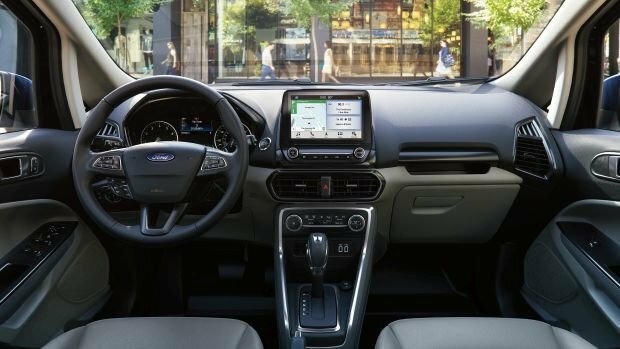 This $1,795 option adds from the SES and Titanium the 8-inch infotainment screen with built-in navigation, Ford Connect telematics, and blind-spot and rear cross-traffic detection. The SES Black Appearance Package should return for $395. For the time being, we will stand by our recommendation to seek a front-drive EcoSport SE with no options. Play your cards right, and it might be possible to get one of these for about $20,000. Expect a 2020 Ford EcoSport release date in the fall of 2019.